This combination of the flower essences of Bluebells, Star of Bethlehem, Aspen, Cherry Plum, Clematis, Elm, Impatiens, Mimulus, Oak, Olive, Orange Hawkweed, Rock Rose, Walnut, Water Violet provides support after acute or critical events as it can bring balance to the system and initiate calm. Tincture of the flowers of Bluebells, Star of Bethlehem, Aspen, Cherry Plum, Clematis, Elm, Impatiens, Mimulus, Oak, Olive, Orange Hawkweed, Rock Rose, Walnut, Water Violet. Alcohol content approx. 27%(v/v). Small Animals: (eg. birds, hamsters etc) 4 drops in food/water 3 times daily until bottle is finished. Medium Animals: (eg. cats, dogs, rabbits.) 7 drops in food/water 3 times daily until bottle is finished. Large Animals: (eg. horses) 12 drops in food/water 3 times daily until bottle is finished. 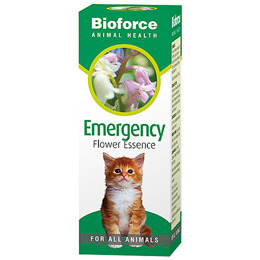 Flower essences are not a substitute for correct veterinary care. If animal is pregnant or lactating please seek professional advice before using this product. Below are reviews of A Vogel Animal Emergency Essence - 30ml by bodykind customers. If you have tried this product we'd love to hear what you think so please leave a review. This combination of flower essences provides support after acute or critical events as it can bring balance to the system and initiate calm.